The last couple of months have been rather busy. If you are friends with me on Ravelry.com you may have noticed the multitude of baby patterns that I have been adding to my favorites and queue. I have good reason for this as I am currently 13 weeks pregnant!! We are super excited to welcome ‘Baby K’ into the world on or around March 8, 2011! In between all of the morning sickness, working, taking care of our son and teaching a knitting class, I somehow managed to whip up a new pattern! 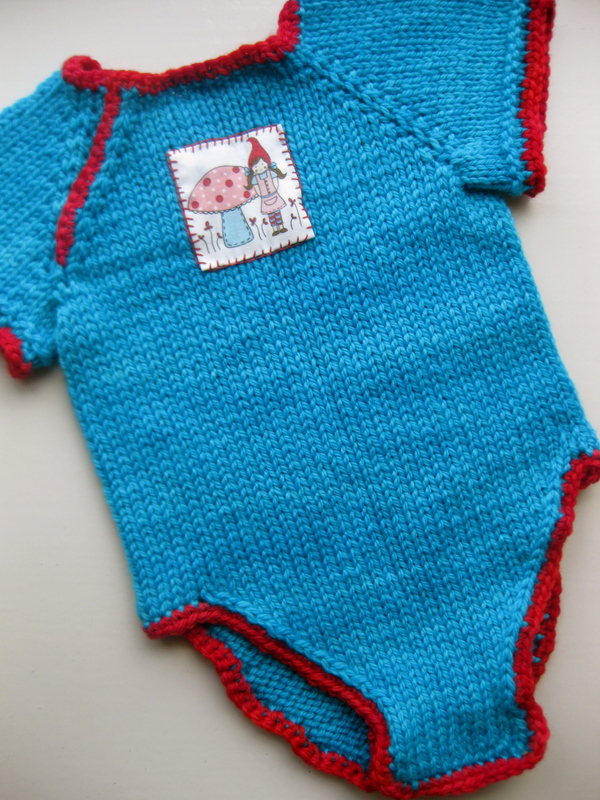 The Knitted Baby Onsie is a great first garment piece for a beginner, a super quick baby shower gift or a stash buster project (only takes one skein!). On September 18th I will be teaching a class at The Knitting Nest to show you exactly how to make this! In the class, I will also be teaching a tutorial on how to attach the snap button closures and the cute little fabric patch embellishment. No sewing machine required! The ridiculously adorable fabric can be found at this Etsy shop called ‘A Little Sweetness‘. This artist designs her own fabric and then prints it via spoonflower.com. WAY cool! The shop owner also has a bunch of embroidery patterns and she loves the aqua/red combo. If we have a baby girl, I will definitely be picking up this kit: Little Red Riding Hood Dress. So yeah, Baby K is on his or her way! So far everything is looking great. We’ve had an ultrasound and also got to hear the baby’s heartbeat. We are going to wait until the baby’s birth to find out the gender (such an awesome surprise!!). Also saving the name announcement until then as well. Wondered why “baby k.” Thought it might be a hint at the name then like a ton of bricks it hit me… LOL. I get it now! Love the pattern. In the “old days” was so much cheaper to make “homemade” stuff! Now it is a labor of love and I sure wish people understood that. Looking forward to meeting “baby k” fur sure! Congratulations! That’s great news! And a very pretty pattern to boot. please could you email me the desigh for this baby vest as i love it so much i am pregnant and want to knit one for my baby and congrats on your baby as you prob have had the baby by now.thank you. I have been looking for a pattern for a baby onesie for a long time, and here it is! Thank-you so much for it! I already know who I’m going to make it for and what colours I’ll use, now just to find the time…….. I have a baby shower to go to on Saturday and found this project on Tuesday. These parents are also waiting to be surprised by the gender. That makes it hard to find baby projects that excite me. Luckily I found some yarn in my stash that was school colors – PERFECT for a dad who teaches and coaches! As it turned out, I picked up my son’s varsity jacket from the local embroidery business and got them to whip up a last name patch to put on the back. Now I have a gift I’m REALLY excited about! I would love to see a photo of the finished project! Are you on Ravelry? « The Knitting Nest and Elijah!